Wonderful children's book written by an eight year old girl! 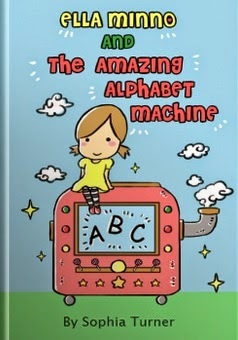 Ella Minno is a playful young child, who together with her friends Abe E. Cee, Jay Kaye and Estie Yew, builds The Amazing Alphabet Machine in order to make learning easy and fun. Throughout the book, Ella and her friends press, pull, skip across and jump up and down on the buttons of The Amazing Alphabet Machine so as to free letters and unscramble them to build words. Each time Ella and her friends use their machine, more letters pop out, urging young readers to form words with three, four, and five or more letters. This is Sophia Turner's first book. She drew inspiration for the character of Ella Minno after listening to her little sister sing the alphabet song and repeatedly combine the letters L, M, N and O. Sophia is 8 years old.